Beer in Barcelona falls into two categories: cheap lagers for which people hold strong allegiances (locality wins over flavor), and artisanal, complex ales that are harder to find on a night out, more fun for hops enthusiasts, and certainly not sold from plastic bags in the corner of Plaça Reial. Beer in Spain, as in all countries, has both high and a low price points. Regardless of whether you can actually tell the difference between one skunky can of beer and the next, people hold their local, “macro”-produced brew close to the heart. In Granada it’s Alhambra. In Seville, Cruzcampo. Madrid is the founding place of Mahou, and Barcelona is the land of Estrella Damm. Of course, each city has several beers of the ‘economical’ nature, but litter never lies—red cans of Estrella Damm dominate public waste bins throughout the Barcelona center. Partly tourists and partly locals, the beer consumption in Barcelona is epic. In fact, Spain as a whole drinks more beer than wine every year—over two times more! The average Spaniard drinks some 68 liters/year, though this impressive statistic pales when compared to the consumption rates of the 22 countries ahead of Spain on the list. The winner? The Czech Republic, at 148.6 liters/year (about one can of beer per day). As the wine world has seen, it takes time and tact to convince consumers to spend more money on small-production, quality products. Craft beer is a huge international movement with over 20 years of momentum, and in Spain, Catalunya has the most labels of all. As if to cement the region’s pride and passion, archeologists found remains of Europe’s oldest beer (5,000 years old) in the Can Sadurní caves near Begues (Barcelona) in 2004; a Neolithic beer to further put Catalunya on the gastronomic map. This past April saw the third annual Barcelona International Beer Festival, with over 300 artisanal beers from around the world—with over 50 producers from Catalunya—offering up dozens upon dozens of local drafts to chose from. Of all of the artesian producers in Spain, over one-third of them are in Catalunya. In fact, according to the Guias de Cerveses de Catalunya 2013, there are nearly 200 craft beer brands and microbreweries in Catalunya alone! Held in the Royal Shipyard (Drassanes) of Barcelona from the 17th century, this years International Beer Festival was the largest yet. However, it’s not just black and white, commercial and craft, ‘micro’ and ‘macro’ when talking about Catalan beer. Barcelona actually has a hip, happy medium: Moritz. The Moritz Factory is a brew pub on the Ronda Sant Antoni that was built in 1864 by an Alsatian lad by the name of Louis Moritz. The beer, first brewed in 1856, has won numerous awards, survived the Civil War through a collective community effort, and is to this day a very visible emblem of the ‘Catalan Cause’. Thirsty activists and artisans at rallies around the city sip from plastic cups filled at Moritz beer tents, as the Estelada waves. 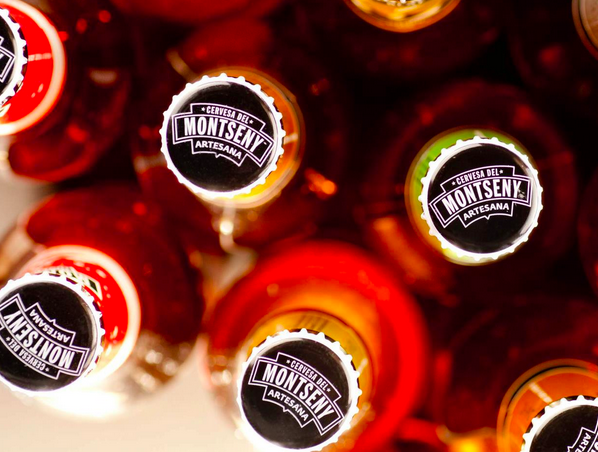 Craft beer production in Catalunya ranges from small scale brewers with just a couple labels like Ratpenat Cervesers (whose maiden beer, named ’2014’, is a testament to a first birthday not-yet-reached), to established, international exporters like Companyía Cervesera Montseny (CCM). With nine distinct bottles, CCM (founded in 2007), made the decision in 2009 to partner with Shelton Brothers importers to bring Catalan craft beer to the United States for the first time. Now Shelton Brothers exports five of the nine CCM beers (with USA-specific label-art based on the paintings of famous Catalan artist Joan Miró), as well as products from three other Catalan breweries: Ca l’Arenys, Marina Cervesa Artesana, and Masia Agullons. To find these Catalan Beers in the United States, use the Shelton Brothers contact form. Ca l’Arenys brewery takes a different approach than the rest with their craft beer brand Guineu (‘fox’ in Catalan). While many Catalan craft beers are made in the English or American style, packing a powerful, hoppy punch, Guineu’s Brewmaster Guzman Fernandez holds firm in his choice to produce beer that’s high flavor but low in alcohol (and IBUs), all with the power of wild yeast. Potentially disappointing to those out to catch a buzz but great for ending a long hike or quenching one’s thirst on a hot Mediterranean beach, Guineu Riner is only 2.5% alcohol per volume. Citrus, flowers, and spices dominate the palate of this bitter-sweet pale ale, making it a great aperitivo that stimulates salivation and appetite. Guineu has six distinct yet mild brews, making them excellent food pairings. Hungry? Look no farther than Barcelona’s modern dim sum hotspot Mosquito (see below), where dozens of international and local beers make for an impressive list and creative accompaniments. Among the local breweries of Barcelona, there is another name that sticks out from the crowd: Almogàver. Named after medieval Catalan mercenaries, Almogàver takes direct notes from old beer tradition, neither filtering nor pasteurizing their beer. Co-founded Víctor Cerdán says that the ‘old-school’ brewing, plus their premium malt that is imported from England and Germany, makes for excellent quality beer. However, the prime ingredients and artisanal methods do pass on costs to the consumer in the end, though the price hike is a relatively easy-to-swallow increase of about €1.00 (compared to the average bottle of “commercial” beer); not a hard sell at all in my opinion. It should be noted that pretty much all Spanish breweries import malted grains because of a lack of domestic product (the Spanish grain industry has yet to shift into the modality of supplying beer companies with this essential prime ingredient). And finally, another beer well worth mentioning is a brew both unique in taste and in formula. Attempting (and achieving) the capture of Catalan terroir, Priorat Beer & Co. of Tarragona offers their Garnatxa Beer, a blended, barrel-aged ale with indigenous garnacha grapes at its base. The grapes lend a wine-like character to the beer, with dried fruit and honey aromas, and a prolonged finish that is amply supported by gentle French oak tannins. Paired with everything from typical Spanish fare to curried rice and sushi (according to their blog), this beer is interesting, though maybe not everyone’s ideal refreshment. In conclusion, it is hard not to notice the ranks of Catalan micro-brews rapidly increasing with each passing year. More and more local bars are catering to those who search for something distinct—something that has a true sense of place and the taste of craftsmanship—and locals are becoming more inclined to open their wallets for a beer that is a step above the average. From restaurants with hearty beer lists to full-on beer havens that double as gourmet shops, Barcelona has the makings of the next full-on bastion of craft brew. Here is a list of some places in Barcelona where you can sample the local suds. La Cerveteca: With around one dozen Catalan beers to choose from, as well as both well-known and unique prodcuts from around the world, La Cerveteca is a bar, shop, and learning center where tastings and educational sessions are held. A light selection of excellent tapas is also available. Mosquito: A much-discussed and always satisfying restaurant, Mosquito is a dim sum spot owned by the boys of Ale and Hop (see below). Great small dishes of fried duck, spicy cucumber salad, braised pork, and steamed dumplings go perfectly with the savy beer list that spans Germany, Spain, the UK, and more. They even have cask beers, hand-pumped and often rotated. HomoSibaris: This place captures the neighborhood of Sants perfectly: small, local, and independent. With a shop, a small bar, and a sunny terrace in Plaça Osca, HomoSibaris offers an extensive series of beer tastings, pairing classes, intro-level education sessions, and practical workshops for professionals. Ale & Hop: A cool places that always has a healthy after-work crowd lining the bar and spilling out onto the quiet, cobble-stoned street, Ale & Hop has a rotating offering of international beers on tap, as well as a small-but-impressive refrigerator of bottles from the USA, Belgium, UK, Catalunya, and more. Added perk for those vegetarians out there: An interesting menu of vegetarian “tapas” to stave off hunger (or soften the blow of that Imperial IPA). La Resistència: With about a dozen beers on tap—mainly Catalan and Spanish—La Resistència is a little place with not too many frills but a cool atmosphere, though reminiscent others. However, the bar is still unique in its attitude and its menu of Catalunya vittles. La Més Petita: “Possibly the beer bar with the most taps per square meter in the city,” they say, and it’s quite possibly true! Eight taps, a minuscule bar, and equally petite food offerings of cheese, cured meats, olives, and anchovies.